Carlos Hyde's fantasy value is measured by his average draft position (ADP) in fantasy football mock drafts. 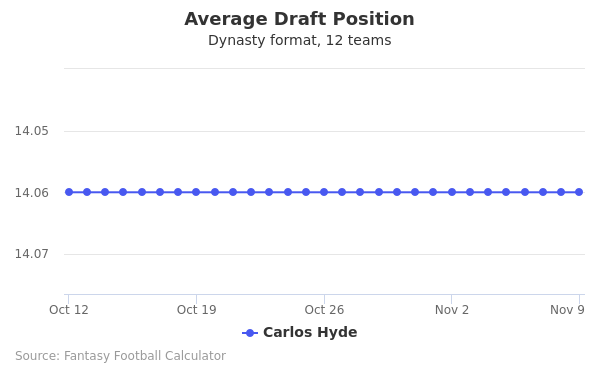 In recent drafts, Hyde's current ADP is 8.08, which indicates that his fantasy outlook is to be the 8th pick of the 8th round, and 92nd selection overall. The code below will display a graph that updates every day to show the ADP data for Carlos Hyde for the past 30 days in 12-team PPR leagues. Draft Carlos Hyde or Marvin Jones? Draft Carlos Hyde or Jared Cook? Draft Carlos Hyde or Dante Pettis? Draft Cam Newton or Carlos Hyde? Draft Carlos Hyde or DeSean Jackson? Draft Carlos Hyde or Courtland Sutton? Draft Carlos Hyde or DK Metcalf? Draft Austin Ekeler or Carlos Hyde? Draft Carlos Hyde or LA Rams Defense? Draft Carlos Hyde or Jameis Winston? Draft Carlos Hyde or Sterling Shepard? Draft Carlos Hyde or Tom Brady? Draft Carlos Hyde or Golden Tate? Draft Carlos Hyde or Gus Edwards? Draft Carlos Hyde or Matt Breida? Draft Carlos Hyde or Trey Burton? Draft Carlos Hyde or Jimmy Garoppolo? 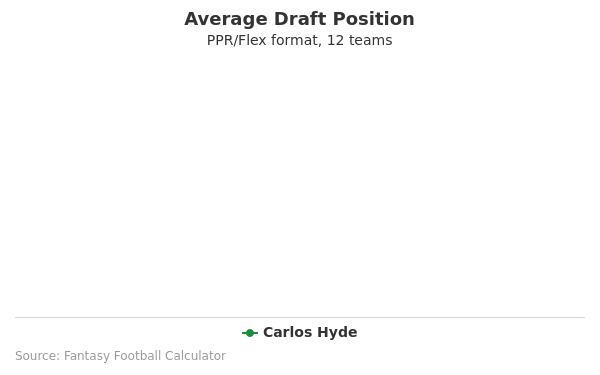 Draft Baltimore Defense or Carlos Hyde? Draft Adrian Peterson or Carlos Hyde? Draft Carlos Hyde or Dion Lewis? Draft Carlos Hyde or Devin Funchess? Draft Carlos Hyde or Marquise Goodwin? Draft Carlos Hyde or Donta Foreman? Draft Carlos Hyde or Kirk Cousins? Draft Ben Roethlisberger or Carlos Hyde? Start Carlos Hyde or Marvin Jones? Start Carlos Hyde or Jared Cook? Start Carlos Hyde or Dante Pettis? Start Cam Newton or Carlos Hyde? Start Carlos Hyde or DeSean Jackson? Start Carlos Hyde or Courtland Sutton? Start Carlos Hyde or DK Metcalf? Start Austin Ekeler or Carlos Hyde? Start Carlos Hyde or LA Rams Defense? Start Carlos Hyde or Jameis Winston? Start Carlos Hyde or Sterling Shepard? Start Carlos Hyde or Tom Brady? Start Carlos Hyde or Golden Tate? Start Carlos Hyde or Gus Edwards? Start Carlos Hyde or Matt Breida? Start Carlos Hyde or Trey Burton? Start Carlos Hyde or Jimmy Garoppolo? Start Baltimore Defense or Carlos Hyde? Start Adrian Peterson or Carlos Hyde? Start Carlos Hyde or Dion Lewis? Start Carlos Hyde or Devin Funchess? Start Carlos Hyde or Marquise Goodwin? Start Carlos Hyde or Donta Foreman? Start Carlos Hyde or Kirk Cousins? Start Ben Roethlisberger or Carlos Hyde? Carlos Hyde is one of the top running backs in the NFL and plays for the San Francisco 49ers; however, nobody has a successful NFL career without having a strong foundation. 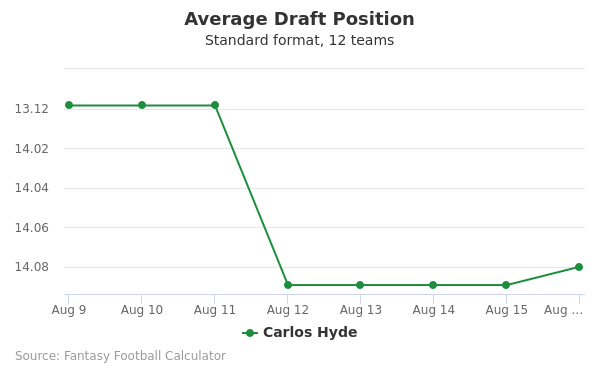 With this in mind, where did Carlos Hyde come from? How did he make his journey to the NFL? Carlos Hyde was born and raised in Cincinnati, Ohio. After playing his childhood football in the area, he eventually attended Princeton High School. He was only there for his freshman year because his family moved down to Naples, Florida. He attended Naples High School for his sophomore, junior, and senior seasons. As a senior, he was named Player of the Year by the Ft. Myers News-Press and the Naples Daily News. During that senior season, he rushed for over 1,600 yards and recorded 16 touchdowns. Like many future stars, he was a three sport athlete who also excelled in basketball and track. Rated as the second-best running back in the nation by Rivals.com, he committed to Ohio State. He also had offers from Florida, Florida State, and Miami of Florida. Carlos Hyde attended college at Ohio State. He was primarily a backup during his first two years but brokeout during his junior year. He rushed for 970 yards and 16 touchdowns despite playing in less than 10 games due to injury. He was suspended for the first three games of his senior year due to an altercation at a local bar but returned to rush for almost 1,300 yards and 14 touchdowns in the final eight games. The Associated Press named him to the first-team All-Big Ten and third team All-American. A highlights video can be found here. Carlos Hyde signed a rookie contract with the San Francisco 49ers. After spending time behind Frank Gore, Carlos Hyde finally got his chance when Gore signed with the Colts. He won the starting job after an intense training camp competition. In his first game, Hyde rushed for over 160 yards and two touchdowns. While he had a promising start to the season, he was placed on injured reserve in mid-December. Carlos Hyde had a terrific 2016 season, one of the few bright spots for a struggling franchise. He rushed for almost 1000 yards despite playing in only 13 games. In addition, he added over 160 receiving yards on 27 receptions. he recorded nine total touchdowns. He was also named as an alternate to the pro bowl in recognition of his outstanding season. He was placed on injured reserve at the end of December due to an MCL injury. A highlights video of his outstanding season can be found here. Carlos Hyde was born on September 20, 1991. He parents are Carlos Britton and Dermidra Hyde. His contract salary paid him over $650,000 this past year. His twitter handle is @elguapo. His instagram name is @el_guapo1. In the 2017 edition of NFL Madden, he was the 39th ranked running back with an overall rating of 77.